Make the Sushi Rice: Place rice and 3 cups water in a medium saucepan; bring to a boil over high heat. Reduce heat to low and simmer, covered, until water has been absorbed, 14 to 16 minutes. Alternatively, cook in a rice cooker according to manufacturer's directions. Prepare an ice-water bath; set aside. Bring a large pot of water to a boil. Add a little salt and the shrimp, and cook until shrimp is opaque, 3 to 5 minutes. Use a slotted spoon to transfer to ice-water bath until cool. Drain well, and cut shrimp in half lengthwise; set aside. Lay 1 sheet of nori, shiny-side down, onto a bamboo sushi-rolling mat with the longer side parallel to the edge of your work surface. 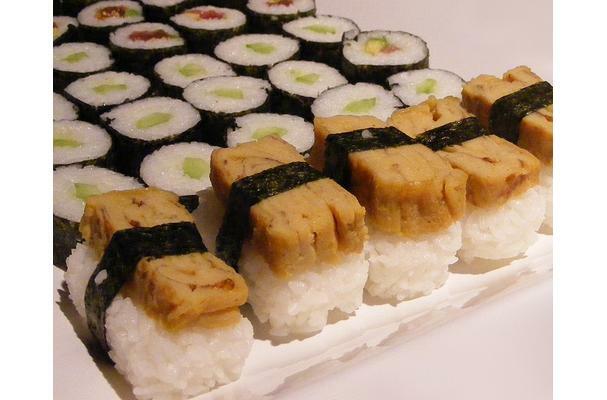 Moisten hands with water, and spread 1 cup sushi rice evenly over nori. Spread a small amount of wasabi across the middle of the rice. Arrange 4 shrimp halves or 1/2 ounce salmon, and a few pieces each of cucumber, mango, and avocado in a line across the bottom third of the nori. Using the bamboo mat, roll into a cylinder, enclosing filling. Squeeze, sealing the cylinder, and remove the mat. Using a serrated knife, slice the cylinder crosswise into six equal pieces. Repeat with remaining ingredients. Serve with wasabi, soy sauce, and pickled ginger. This recipe yields 6 rolls (about 36 pieces). Thank you for sharing such a detailed recipe! So helpful!